Drawing on the Right Side of the Brain is the world's most widely used drawing instruction book. 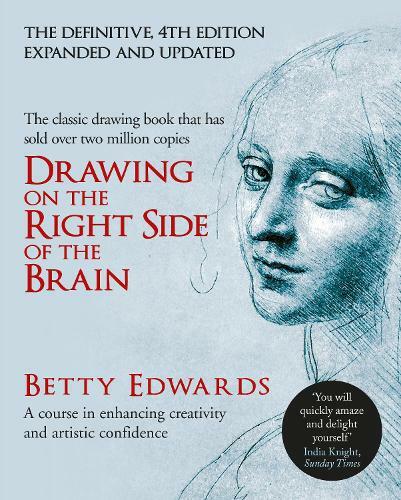 Whether you are a professional, a student, or enjoy art as a hobby, Betty Edwards' practical step-by-step guide to drawing will give you greater confidence in your ability, deepen your artistic perception and provide a new way to appreciate the way you perceive the world around you. Edwards breaks down first steps to ensure the reader has a practical grounding that will help them improve and have fun learning more difficult techniques. Edwards gives her expert advice on what materials to use and the importance of making a record of your starting point, with three key exercises: drawing a person from memory, a self-portrait, and drawing your hand. With great advice on how to look at these first attempts, she provides the reader with a guide to measure their progress and the ability to understand what you are doing and learn from every attempt so that none are wasted. The later sections of the book focus on perceiving edges, spaces and relationships within your drawing before applying these skills in solving problems and ultimately being free to continue on your own. Edwards will help you to shift to the right side of the brain that utilises more intuitive and artistic aspects of thinking.